Two U.S. Army facilities in Michigan and Illinois were honored for interior lighting retrofits that are paying off in significant energy and cost savings. The lighting retrofits are expected to save 246,000 kilowatt-hours annually, which is equivalent to the electricity used to power 23 homes per year. The U.S. Department of Energy (DOE) recognized the U.S. Army Reserve 88th Readiness Division in the exemplary recognition categories as part of DOE’s Better Buildings Program 2017 Interior Lighting Campaign. 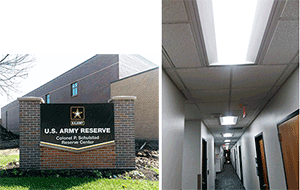 At the 94,000-square-foot Army Reserve Center in Illinois, the project retrofit included 1,225 rectangular, ceiling-based light fixtures called troffers, reducing lighting energy use by 72 percent. At the 8,000-sq-ft Army Reserve Center in Michigan, 94 troffers were retrofit, reducing lighting energy use by 63 percent. The installations included replacing existing lights with LEDs and adding occupancy sensors throughout both facilities, so that the lights turn off in the room when light is not needed. Find out more about these projects in PNNL’s case studies. The Army is saving $18,000 in energy costs annually for these two facilities. And because LED lights typically operate five times longer than the previous fixtures, the Army Reserve expects to cut back on its labor and repair costs as well. The 88th Readiness Division supports the Army Reserve soldiers and civilians in a 19-state region across the Midwest, Great Plains, and Northwest. The facilities are used for training, administration, and storage.